This photo shows the storage sidings at Sandyford Depot where 4009 and 4011 are waiting for their next duties on 14th July 2007. Sandyford Depot was the only depot on the Green line until the Cross City extension was opened at the end of 2017 but has now been joined by a new structure at Broombridge. Also of note is that at the time of this image being captured Sandyford was the terminus of the Green line although it has since been surpassed by Brides Green. Both of trams are Citadis 401 trams built by Alstom for the opening of the Green line. 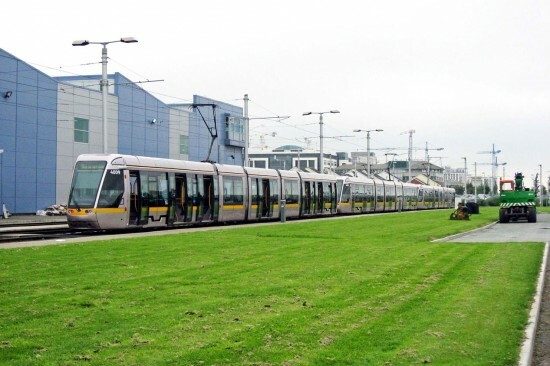 Once the Citadis 402 trams arrived in Ireland these trams were transferred across to operate on the Red line. This entry was posted in Dublin Luas, Picture in Time. Bookmark the permalink.